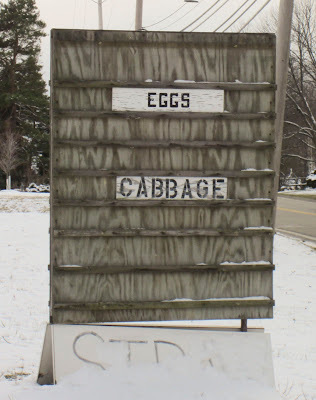 I pass this local farm stand several times a week. We always laugh at how bare the welcome sign gets the closer we are to winter and bad weather. Signs advertisng corn, tomatoes, zucchini, pumpkins and more give way to winter's offerings: eggs and cabbage and maybe straw. Soon, the signs will be advertising more items once again, but it's hard to be patient since snow came our way this week. But in keeping with March's unpredictability, the weather is supposed to be warm (50s and 60s) the rest of the week and snow will soon be a memory.